Adrian Rawlins - JaiBaba.com! Your Avatar Meher Baba Oasis on the net! 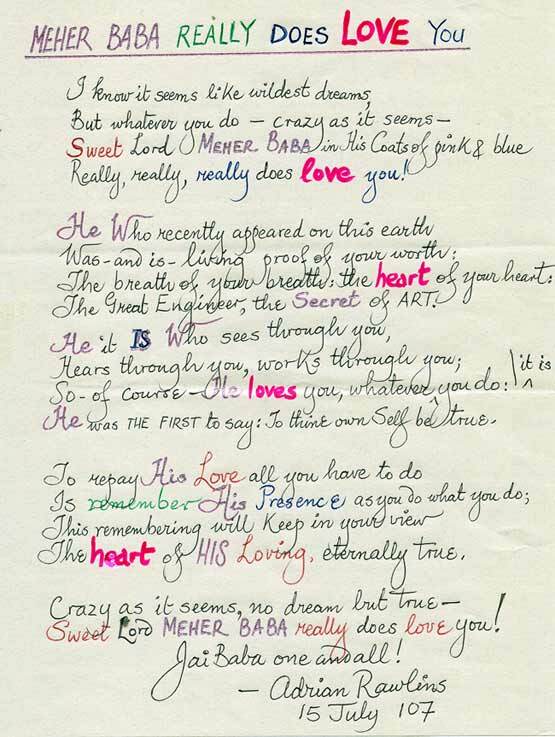 Meher Baba was Adrian's first love, poetry his second. He was regarded by many as one of the best readers of poetry in the world today. To read our tribute to dear Adrian click here. Adrian Rawlins has been at the forefront of quality arts activity for over 30 years, and during this time his many talents have been appreciated in the fields of poetry, theater, mime, dance, rock music, jazz, radio and visual arts. Adrian Rawlins has been called a leading figurehead on the Australian Music scene, one of the best loved eccentrics in the Australian Arts, and an antidote to dreary conformity. Meher Baba is Adrian's first love,poetry is his second. He is regarded by many as one of the best readers of poetry in the world today. Below are a few small treasure, Enjoy. not with heavy water, effervescent LIGHT.